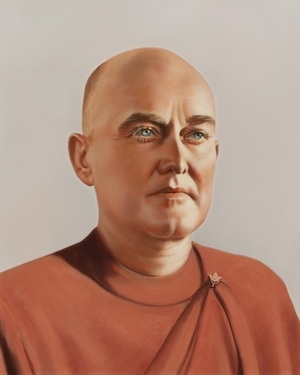 Rajarsi Janakananda (James J. Lynn) was a beloved disciple of Paramahansa Yogananda, and first successor to him as president and spiritual head of Self-Realization Fellowship/Yogoda Satsanga Society of India until his passing on February 20, 1955. Mr. Lynn first received Kriya Yoga initiation from Paramahansaji in 1932; his spiritual advancement was so swift that the Guru lovingly referred to him as “Saint Lynn,” until bestowing on him the monastic title of Rajarsi Janakananda in 1951. The biographical sketch is extracted from the book Rajarsi Janakananda: A Great Western Yogi, published by Self-Realization Fellowship. The book contains a more detailed biography and excerpts from his talks. It also features more than sixty pages of Paramahansaji’s personal correspondence with him — words of guidance and love that offer glimpses of the intimate spiritual accord they shared, and powerfully convey the depth of the guru-disciple relationship.